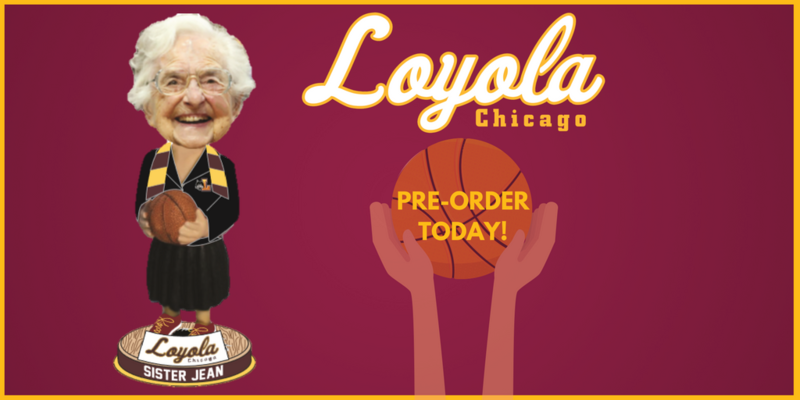 New bobblehead featuring Loyola University Chicago’s Sister Jean are now available for pre-order in the National Bobblehead HOF and Museum Online Store or at www.loyolaramblers.com. Milwaukee, WI – March 23, 2018 – Today, the National Bobblehead Hall of Fame and Museum unveiled the rendering for a new, limited edition bobblehead featuring Loyola University Chicago’s Sister Jean Dolores Schmidt. Sister Jean is the 98-year-old team chaplain for the Loyola Ramblers, and has been trust into the spotlight with Loyola’s unbelieve run in the 2018 NCAA Tournament. The bobbleheads, which feature Sister Jean in her Loyola jacket and scarf, are available for pre-order in the Hall of Fame and Museum’s Online Store. The bobbleheads cost $25 each plus a flat rate shipping charge of $8 per order and are expected to arrive in June. Each bobblehead will be individually numbered and come in a collector’s box. Sister Jean has been the team chaplain for Loyola University’s Men’s Basketball Team since 1994. As the Ramblers have won their way to the Elite Eight in dramatic fashion, Sister Jean has captivated the nation with her positive attitude and support for her team. According to Twitter, Sister Jean was the most tweeted about person of the NCAA Tournament’s opening weekend, and her popularity has led to an onslaught of media attention for the 98-year-old nun. This is the second bobblehead for Sister Jean, who had a bobblehead in her likeness given away at games in 2011 and 2015. Those bobbleheads are now hot commodities, selling for over $300 each on eBay. A portion of the proceeds from the sale of each bobblehead benefit the Loyola Athletic Fund and the Sisters of Charity of the Blessed Virgin Mary. The bobbleheads, which are being produced by the National Bobblehead Hall of Fame and Museum, are officially licensed by Loyola University Chicago and are being produced in conjunction with the Loyola University Athletic Department. The National Bobblehead Hall of Fame and Museum was announced in November 2014. The HOF and Museum hosted a Preview Exhibit in 2016, and is currently planning for a permanent location, which is expected to open in April 2018. The HOF and Museum also produces high quality, customized bobbleheads for organizations, individuals and teams across the country. Visit us at www.BobbleheadHall.com, www.facebook.com/BobbleheadHall or www.twitter.com/BobbleheadHall. Founded in 1870, Loyola University Chicago is one of the nation’s largest Jesuit, Catholic universities, with more than 16,600 students. Nearly 11,500 undergraduates call Loyola home. The University has four campuses: three in the greater Chicago area and one in Rome, Italy, as well as course locations in Saigon-Ho Chi Minh City, Vietnam; Vernon Hills, Illinois (Cuneo Mansion and Gardens); and a Retreat and Ecology Campus in Woodstock, Illinois. The University features 13 schools, colleges, and institutes, including the Quinlan School of Business, Marcella Niehoff School of Nursing, Stritch School of Medicine, College of Arts and Sciences, School of Communication, School of Continuing and Professional Studies, School of Education, School of Law, School of Social Work, Graduate School, Institute of Pastoral Studies, Institute of Environmental Sustainability, and Arrupe College of Loyola University Chicago. Ranked a top national university by U.S. News & World Report, Loyola is also among a select group of universities recognized for community service and engagement by prestigious national organizations like the Carnegie Foundation and the Corporation for National and Community Service. To learn more about Loyola, visit LUC.edu, “like” us at Facebook.com/LoyolaChicago, or follow us on Twitter via @LoyolaChicago or @LoyolaNewsroom.